In this last remnant of the Wild West—where oilmen like J. P. Getty made their fortunes and where desperadoes such as Al Spencer, “the Phantom Terror,” roamed – virtually anyone who dared to investigate the killings were themselves murdered. As the death toll surpassed more than twenty-four Osage, the newly created F.B.I. took up the case, in what became one of the organization’s first major homicide investigations. But the bureau was then notoriously corrupt and initially bungled the case. Eventually the young director, J. Edgar Hoover, turned to a former Texas Ranger named Tom White to try unravel the mystery. White put together an undercover team, including one of the only Native American agents in the bureau. They infiltrated the region, struggling to adopt the latest modern techniques of detection. Together with the Osage they began to expose one of the most sinister conspiracies in American history. In Killers of the Flower Moon, David Grann revisits a shocking series of crimes in which dozens of people were murdered in cold blood. The book is a masterpiece of narrative nonfiction, as each step in the investigation reveals a series of sinister secrets and reversals. But more than that, it is a searing indictment of the callousness and prejudice toward Native Americans that allowed the murderers to operate with impunity for so long. Killers of the Flower Moon is utterly riveting, but also emotionally devastating. It seems we’ll never run out of shameful chapters from America’s past. In Killers of the Flower Moon, writer David Grann explores the “Reign of Terror” waged against the Osage tribe in Oklahoma during the 1920s. The murder epidemic itself is horrifying, and so too are the years that came before in Osage history. For starters, when the Osage were forced off of their previously held land, they ended up settling in a rocky area of Oklahoma clearly unsuited for farming, feeling that it would be a stable home since the land was worthless and wouldn’t be taken over by white men. The irony, of course, is that under the land were undiscovered oil deposits that would soon turn the Osage into millionaires. The members of the Osage tribe were allotted “headrights” — basically, a share of the oil and mineral ownership — and these headrights could not be sold, only passed on through family members. At the same time, the government considered the Native Americans incapable of managing their own affairs, and adult Osage who were deemed incompetent (and most were) were required to have white guardians to manage their money. 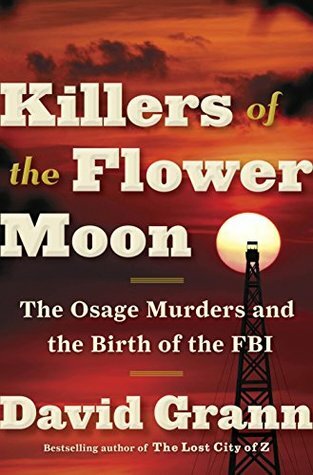 As we see in Killers of the Flower Moon, there was a lot to be gained by finding ways to either manipulate the Osage through shady business dealings and corrupt guardianships, or more directly, by murder. Mollie Burkhart is the initial focus of the book, and we see as her entire family is wiped out, one at a time, through violent murder or insidious poisonings. Between the crimes themselves and the bungling and corruption of the investigation, Mollie and her tribe lived in terror and with a very real threat hanging over their heads. Part I of the book explores the crimes, and Part II traces the involvement of the Bureau of Investigation (forerunner of the FBI), as well as the early stages of the Bureau’s investigative approach and its evolution under J. Edgar Hoover. We see the lawmen tasked with investigating the murders, and follow them all the way through to the eventual arrests and convictions of the men involved. In Part III, the author describes his research and what he uncovered in historical archives, through which he finally unearthed evidence that helped some descendants of the victims find a sense of resolution. The subject matter of Killers of the Flower Moon is fascinating and very, very disturbing. However, I did find myself losing interest at various points, especially in Part II, as the sections about the Bureau and its processes just didn’t grab me as much as the parts focusing on the Osage tribe members and their experiences. I also wished that I’d felt a more personal connection to some of the people involved. While we learn what happened to Mollie and her family, Mollie herself often seems unknowable. Granted, this is history, not a dramatization, but I still wish there was some way to get more of a glimpse beneath the individuals’ surfaces. I recognize too that my lack of interest or focus in certain parts of the story may say more about me as a reader than about the actual book itself. I can be easily distracted when reading non-fiction, and I might not have always been in the right frame of mind to truly appreciate what I was reading. Even people (like me) who tend not to read a lot of non-fiction will find themselves absorbed by the story once they pick up Killers of the Flower Moon. Highly recommended. For more on the movie, go here. To read the New York Times review of the book, go here. In on my TBR (I plan to read it soon). Maybe you’ll find more connection there. Interesting — thanks for the suggestion! I’ll check it out. Hmm…I might read this one next year. I was looking up true crime books on Goodreads for the Book Riot 2018 reading challenge when your link there lead me to your review here. Good one.